History Colorado Center wanted to make a strong statement about Colorado’s history for the Center’s the Great Hall. A spectacular video wall, 30 feet wide by 9 feet high, was designed with a dual purpose. 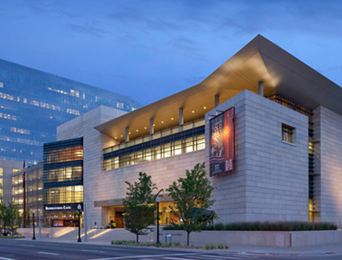 As an exhibit, the array’s irregular shape captures the magnificence of the Colorado landscape, the skyline of the Rocky Mountains and the graphics of native Indian art. 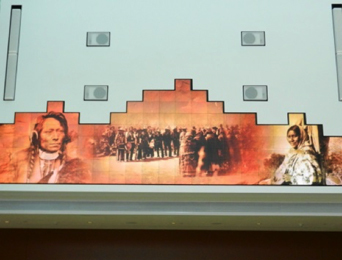 The wall portrays the history of Colorado, displaying panoramic images and animations of the early days. During events, the wall provides spectacular High Definition images of the presenters, graphics, videos and other presentation material. At over 500,000 cubic feet, the Great Hall the audio system was designed to “aim” the sound to the listeners rather than “bounce” the sound around the room. 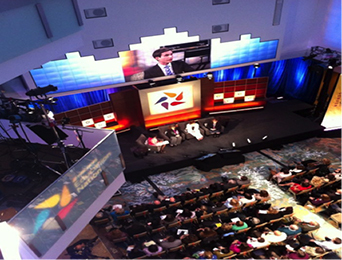 A presentation production system, designed to support all types of events provided complete control from the Great Hall or the adjacent large auditorium. Meeting spaces, conference rooms and distance learning classrooms and all are interconnected allowing the sharing of resources.